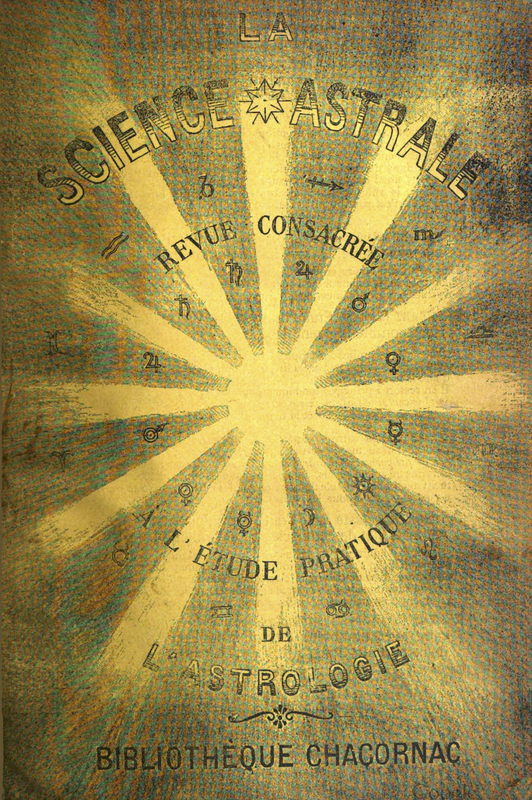 Revue consacree a l'etude pratique de l'Astrologie / Revue consacree a l'etude pratique de l'Astrologie et des sciences similaires (physiognomonie, chiromancie, graphologie) / Revue mensuelle theorique et pratique et des sciences astrologiques accessoires, physiognomonie, phrenologie, chiromancie, graphologie. Paris, France. Language: French. Publisher: Bibliotheque Chacornac. 1/1, January 1904-1907. 48 pp., 10 francs a year. It announced as its goal "to demonstrate the exactitude of teaching and perfecting, by practice, the science of astrology and related interests (physiognomy, phrenology, chiromancy)." It is also proposed to develop in the journal the consequences and the scientific, moral and social application of these areas." In addition to strictly astrological matter, the journal carried a "Partie Philosophique" which regularly carried Barlet’s own articles. Barlet, in addition to his other claims to our attention, was the reviver of astrology in France. Noted in Monde Occulte, 1904. BNF.